Tiger Woods shot 70 but missed at least three short putts. So said Tiger Woods after his morning trip around Augusta National Golf Club to start his bid for a fifth Green Jacket and a 15th major championship. Overall Woods played well by early standards where 69 led in the morning wave. “I missed in the correct spots,” said Woods whose stats showed he hit nine of 14 fairways, 11 of 18 greens and used his putter 28 times on his way to a two-under par 70. 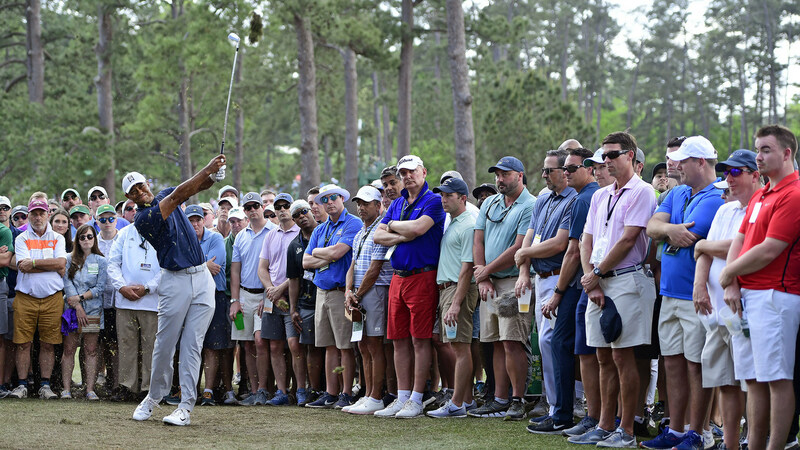 “I missed a few,” Woods acknowledged, knowing his putter cost him, especially early on the front nine where he missed from inside six feet for par at the difficult, re-modeled fifth then again from about five feet for birdie at the sixth. He had his third inside 10 feet at the par five eighth and he missed that as well. “Other than that, it was a good solid day,” Woods said of his four-birdie, two bogey effort that left him tied for 11th at two-under. “It was a good solid start,” Woods reiterated. “I shot 70 three times the first round and won three Green Jackets. His historic 1997 win started with a round of 70 but it looked nothing like this one. On that day, Woods opened with a 40 on the front nine then shot 30 on the back.